As a person who likes to be efficient (or aka lazy), I would want one distributor to cover as much ground as possible so I don’t have to approach each outlet individually. Regardless of who I pick, they are going to take a commission anyways in exchange for aggregating outlets. 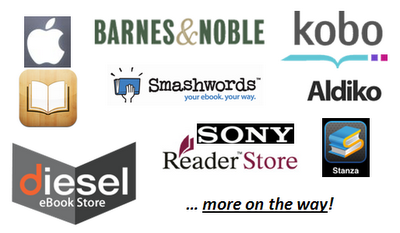 Here are a few of the common distributors, their network list for eBooks and commissions they charge. Obviously, the more commission they charge, the less you make. Amazon Amazon International, books are available to over 170 countries They keep either 30% or 65% of profit after distribution fees. You can set a royalty rate of 70% or 35%. The difference is that for 70% royalty rate you have to pay for bandwidth charges per book. There is a community forum with lots of facts and tips. Repro India (India) They keep 60% of profit after distribution fees.You keep 40% royalties after distribution fees. Pretty bare bones, not much extras as this is supposed to be for small presses and not self-publishing authors. Whitcoulis (New Zealand) They keep 40%-60% of profit after distribution fees.You keep 40%-60% royalties after distribution fees. Lots of free books on how to distribute eBooks (free regardless), Smashwords author page and other promo stuff such as setting up pre-orders. Barnes & Noble Barnes & Noble, books are available to over 30 countries. They keep either 35% or 60% of profit after distribution fees.You can set a royalty rate of 65% (book priced $2.99 – 9.99) or 40% (<$2.99) after distribution fees. Kobo Kobo International, books are available to over 190 countries. They keep either 30% or 55% of profit after distribution fees. You can set a royalty rate of 70% (book priced $1.99 – 12.99) or 45% (<$1.99) after distribution fees. Apple Ibooks Apple International, books are available to over 50 countries. They keep 30% of profit after distribution fees.You keep 70% royalties after distribution fees. Vook (US) They keep 15% (Vook storefront)-60% of profit after distribution fees.You keep 40%-85% royalties after distribution fees. Fancy analytics software, marketing promo advice and white papers. Vook estimates that the three biggest distributors of eBooks in the United States—together accounting for an estimated 95% of sales—are Amazon (60%), Barnes & Noble (15%), and Apple (20%). At the moment the US is still the largest eBook market although there are reports that claim by 2017 it will be Europe. Keep in mind that no matter which distributor you chose, you can opt out of certain outlets. For example, I can sign up with Ingram Spark, but chose not to distribute to Amazon through them so that I can earn more royalties by dealing directly with Amazon. It is a difficult decision to make, should you give up more royalties for potential reach? Would it be worth it? Ingram is the biggest distributor on the list, but just because you put your book there it doesn’t mean it will sell! At the end of the day you still have to do a lot of your own marketing because no one will help you toot your own horn! Good luck!